Awareness ribbons for your cause! Custom awareness ribbons, pins, cancer ribbons, bracelets & bulk fabric ribbons. Wear one today! Enter your awareness cause or awareness color in the bar below to search by awareness cause or color for a ribbon, pin, or colorful bracelet. Personalized Cause is the only online store where you can customize individual enamel awareness ribbon pins with a name, date or message - one ribbon pin at a time. Our custom awareness ribbon pins, which were the original catalyst behind the Personalized Cause website, are designed to help call attention to the notion that behind each awareness ribbon is a person whose life has been impacted by either medical, social or mental health issues or concerns. In other words, you only need to engrave and wear one custom pin to ignite meaningful conversation, advocate for change, or raise awareness. Our awareness ribbon pins, in a rainbow of colors that correspond to a multitude of causes, are designed to show support, bring awareness to social issues, or shed light on misunderstood or rare diseases. Our slogan: *Now It's Personal* says it all: Our ribbon pins are designed to show that behind the awareness ribbon symbol are personal stories of struggle, hope, inspiration, celebration and loss. Combining an awareness symbol with a few meaningful words makes our slogan that much more poignant and our pins that much more personal. It’s easy to show support with a personalized, engraved message. For example, you can order several pins of the same color, yet engrave each one differently. Some people have engraved "Mother," "Aunt," "Sister," and "Friend" on pins of the same color to demonstrate love and support for a person going through a difficult health journey or after the loss of a loved-one. Creating a community of love and support is one of the most personal and meaningful ways Personalized Cause makes an impact on the lives of others. Custom awareness ribbons (pins) are sold individually for $12.95 each, and measure 1.5” (H) x 1” (W). The engraving is done on the bar in the center of the pin where the words, Personalized It!, are displayed. The size of the engravable area is approximately .25" (H) x 1" (W). You will be prompted to enter your personalization at check-out in your shopping cart. Customization is included in the price of the ribbon pin and includes up to two lines of engraving. Because the space is small, we ask that you limit each line to 20 characters, if possible. Although we can engrave more, the size of the font will be reduced as the number of characters increases. In addition, all our hard enamel custom awareness ribbons (pins) coordinate in color and style with our hard enamel classic ribbons (pins), allowing for a more subtle approach to raising awareness. Each enamel pin is sold individually. Ribbon pins are sold for $4.95 each, and measure 1.25” x .75” (W). Our KNOW MORE awareness wristband bracelets color-coordinate with our awareness ribbon pins and bulk fabric awareness ribbon loops. These color-coordinated awareness products allow advocates to maintain a consistent color theme at different price points and in various styles, which can be used during awareness campaigns, fun runs or walks, and group meetings or gatherings. In fact, at times, we have made custom awareness pins for a person's family, provided awareness wristbands in the same color for friends, and supplied fabric ribbons in bulk for community support. With this continuity of color, our awareness products communicate a very strong and personal message. Wristbands are sold individually for the nominal price of $1.00 each. Wristband bracelets measure 8" (L) x .5" (W), and accommodate up to a 7 1/2" wrist size. Lastly, we offer fabric awareness ribbons in bulk, either in satin or grosgrain, that communicate a message of support, love and inspiration on a larger scale. These pre-formed fabric awareness ribbon loops, sold in quantities of 250 per bag (safety pins included), raise awareness and support advocates for medical, social or psychological causes and change. Available in 3/8" satin or grosgrain, these pre-formed fabric awareness ribbons are welded at the center, and measure 1" (W) by 2.5" (H). There are 250 awareness ribbons per bag, which is approximately $.20 per fabric awareness ribbon. Bags of 250 fabric ribbons (bulk) are $49.95 each, and include safety pins at no charge. Great for fundraisers, charity events, nonprofit organizations, rallies, walks, runs for the cure and more! Our fabric ribbons with attached pin, in bulk, will soon be available to personalize with a logo or special message. Display your support in a wide variety of colors that correspond to our wristband and enamel pin colors. Minimum quantity is 250 ribbons. Price includes a printed area on the left tail of the fabric ribbon with an imprint area of 3/8" (H) x 2 - 1/4" (W). One color printing. Arthritis is one of the most widespread health conditions in the United States. Calling attention to it during the year with arthritis awareness ribbons, and especially during May’s Arthritis Awareness Month, allows individuals and communities to recognize that about one in four adults is affected with the condition. That equates to about 54 million men and women, and the reason that we call attention to it as a special condition on our website. In particular, arthritis affects working-age adults, older adults, and even children. The number of adults who live in rural or urban areas and are affected by arthritis was the topic of a recently published report by the CDC. Researchers found that more adults in rural areas are affected by arthritis with nearly 1 in 3 affected. Adults living in the most rural areas were more limited by their arthritis, too. Arthritis limitations can include difficulties with moving and performing daily tasks, as well as social and work limitations. Walking is a great form of physical activity to help manage chronic diseases like arthritis, and this is stressed during Arthritis Awareness Month in May. At Personalized Cause, we offer a large selection of cancer awareness ribbons in either a personalized or non-personalized style. Our line of cancer awareness ribbons helps to raise awareness about the unique challenges of a cancer diagnosis, and allows others to support the survivor with this universal symbol of hope. Please consider wearing a cancer ribbon as a gesture of love and support of a survivor, or in memory of a loved-one. We have a cancer glossary to help you become more familiar with words a cancer survivor might use. Please feel free to reference it frequently. It is located in the Awareness Resources portion of our website. 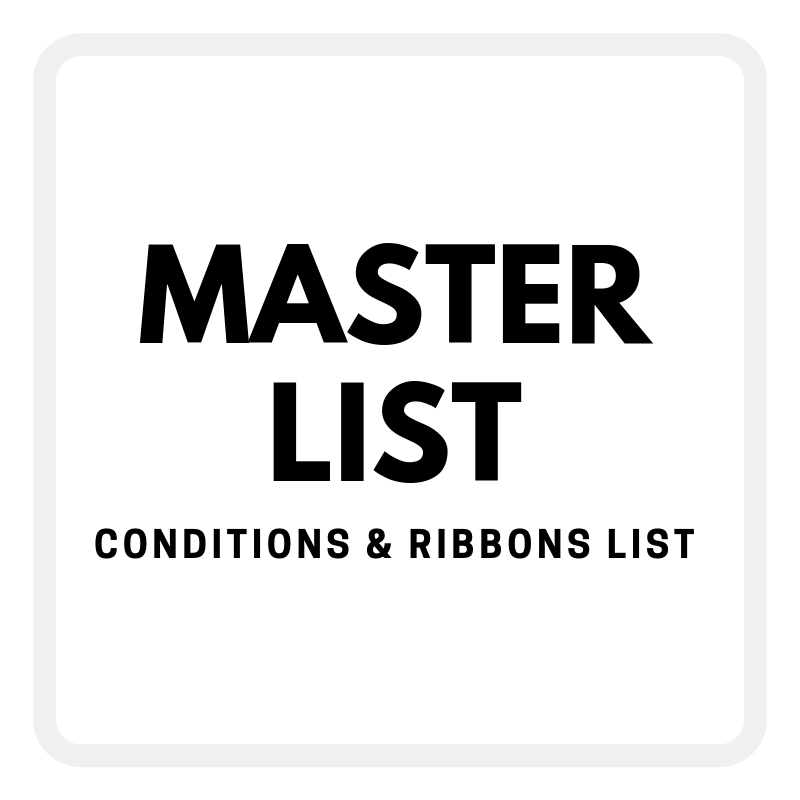 Our custom zebra awareness ribbons and non-personalized, classic zebra awareness ribbons also support our list of Rare Diseases. 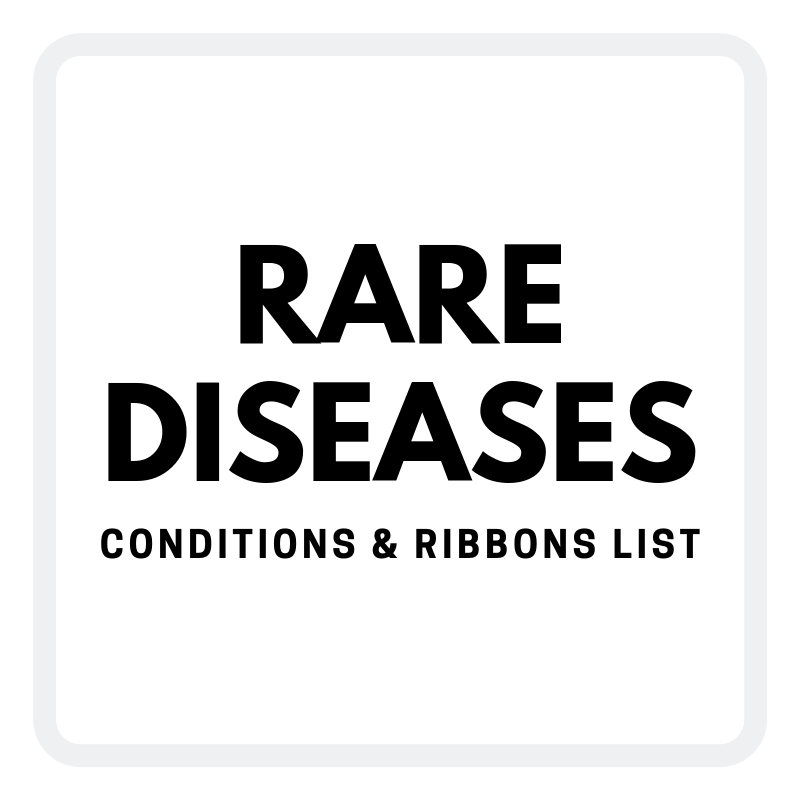 As you see on our website, rare diseases also use the blue denim ribbon. Prior to the use of blue jeans awareness ribbons, zebra awareness ribbons represented rare diseases. Rare diseases use a zebra stripe awareness ribbon because of the medical expression “When you hear hoof beats, think horses not zebras” in looking for a common diagnosis versus a rare one. Our custom Blue Jeans awareness ribbons and non-personalized, classic Blue Jeans awareness ribbons support our list of Rare Diseases as designated by Global Genes®. This list is extensive to include often under-funded, unknown diseases and disorders that need equal attention to those that receive a great deal of funding and recognition. Sometimes you will see a Rare Disease listed in two places on our website, and one may be associated with a color other than the Blue Jeans awareness ribbon. This is because often times a group has designated a color for a Rare Disease prior to the Blue Jeans awareness ribbon being designated for the entire category of causes. Raise awareness for change and the need for a cure...because now it's personal!